Open Office Impress is one of the office automation program that could be use for our documents. This application program that could be installed in our computer is the same with the Microsoft Office Power Point Presentation. This program would be use for presenting our documents to our audience either in a board meetings, seminars, or to the school rooms. This program is free to download and own by the Apache Software Foundation. Unlike the Microsoft Office you need to buy the program before you can installed and use this office automation program. Just download this program here:File Hippo Search and install it in your computer before you can use it. But you need to learn first the basic parts of the open office impress. TITLE BAR- this is use to display the filename of the document with the control toolbox installed in the right side end. 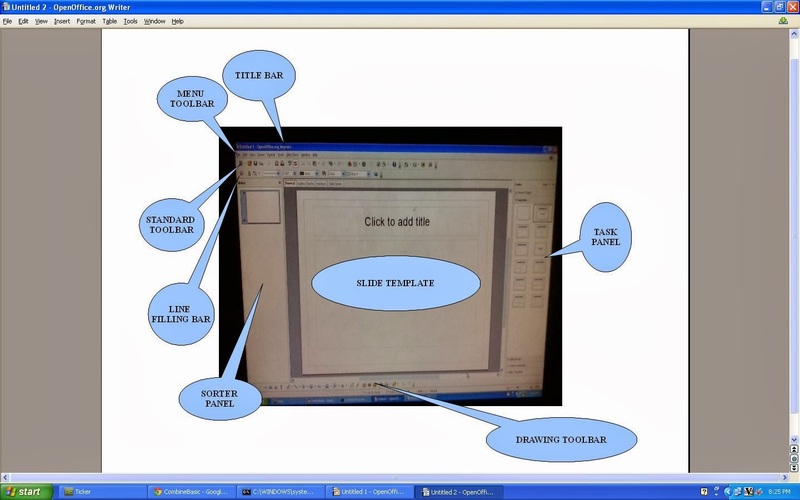 MENU TOOLBAR- these are the tools could be use for your application of the document presentation, such as the page setup that could be found in the Format menu. STANDARD TOOLBAR- this bar compose of common tools in a command button that usually use in our presentation document, like undo and redo, spelling and grammar check or the save button. LINE FILLING BAR- this bar is use for formatting, such as color filling and line width thickness. SORTER PANEL- all of the sl;ides will arrange in this panel and easily access by the user and can be change its arrangement by dragging your mouse. SLIDE TEMPLATE- this is the document template where the objects and text put here for any format and and animation such as effects of sound and motion. TASK PANEL- these are compose of layouts and design for the application, such as table design, custom animation, and transition. DRAWING TOOLBAR- the tools inside here is ready to use all you have to do is click and put it where you want to position. Such as the callouts that could be use to input the certain name of a part. That's all just follow this post for the next updates of the Open Office. Just study also the part and usage of the MS- Power Point.